The Spit of the Basil Island in St. Petersburg is one of the main and the most beautiful ensembles of the Northern capital. From here, from the Exchange Square, two embankments diverge - Universitetskaya and Makarova. This is one of the favorite places for Petersburgers and guests of the city. The history of the ensemble creation of the Spit of the Basil Island. 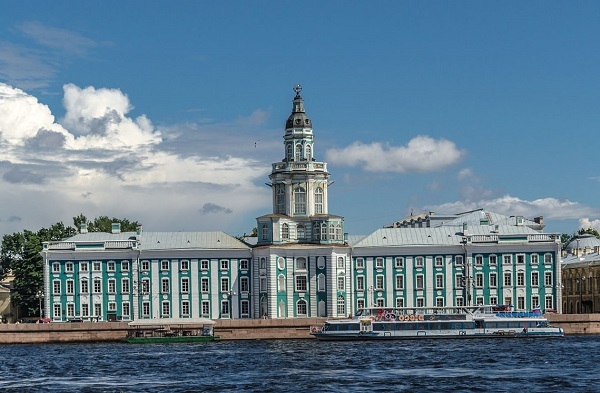 Having laid down Peter and Paul Fortress on the Hare Island, Peter the First wanted St. Petersburg to become a sea fortress and a shopping center. 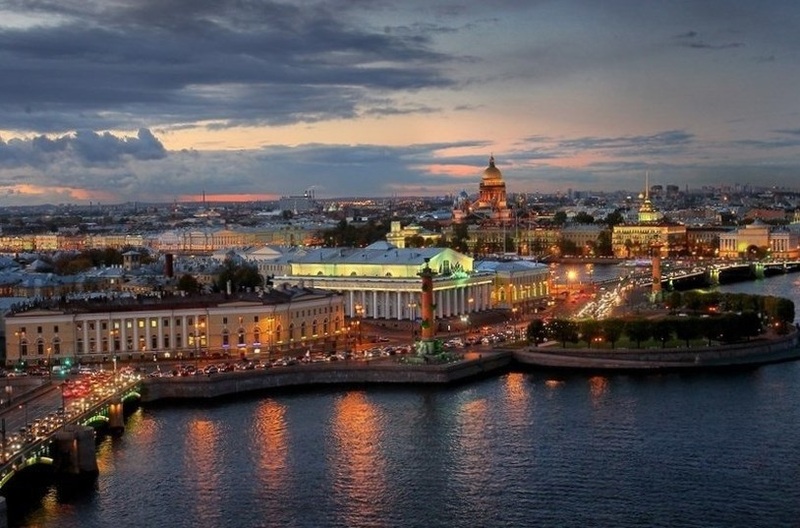 But because of the shallow waters the port onthe Petrograd side could not develop and it was decided to transfer it to theVasilievsky Island.Eastern Cape of the island, where the Neva is divided into the Bolshaya and Malaya, was named the Arrow of the Vasilyevsky Island. Peter planned to make it a business and commercial center. Here the area was sublime so windmills-sawmills are being built. In the southern part of the cape on the banks of the Great Neva (now the University embankment) the Palace of Queen Praskovia Fedorovna is being built, now it is the building of St. Petersburg Academy of Sciences and later - the Cabinet of Curiosities. In the northern part, on the banks of the Little Neva (now the Makarov Embankment), the House of Barons Stroganov is being built, the Guest Yard appears. In order to make the Spit as a business and cultural center the architect Domenico Trezzini developed a project, according to which the main square of the city was supposed to be a square on which the building of the Twelve Colleges will be located. The area is called Kollezhskaya. An extended construction has been built and consisted of 12 identical parts, had 400 meters length, confined the area from the west. With its end the building of the Twelve Colleges goes to the present University embankment.There 10 ministries, the Senate andSynod were settled. Later this building was transferred to St. Petersburg University. With the transfer of the Seaport to the Spit in the 1720s, the wooden building of the Exchange, the Customs (built symmetrically to the cabinet of curiosities, now - the Museum of Russian Literature - Pushkin House) appeared in the northern part. The Seaport was under the developing. When ships came here, the trading was carrying out by overseas goods and even exotic animals - monkeys, talking parrots, turtles on the Square. In 1885 the port was transferred to Gutuevsky Island as new ships with deep draft couldn’t enter the Neva any more. The central building of the architectural ensemble of the Spit of the Basil Island is the Stock Exchange building, built according to the project of the French architect J.F.Tom de Tomon in the style of classicism. The building of the exchange devided the square into two parts: the western is Kollezhskaya square and the eastern is Semicircular Exchange. Later, the building of the Clinical Midwifery and Gynecological Institute was built on the Kollezhskaya Square and the idea assigned to Peter the Great was finally lost. The building of the exchange in its forms reminds an ancient Greek temple and looks like a rectangle on a high granite base decorated with strict marble columns from all sides. Facade of the Exchange from the Neva is decorated with a sculpture"Neptune with two rivers. "And on the opposite side of the stock exchange there is a sculpture "Navigation with Mercury and two rivers". From 1940 to 2003 the Central Naval Museum has been located, which formerly was located in the Admiralty building (now the museum is located at the Labor Square, 5). 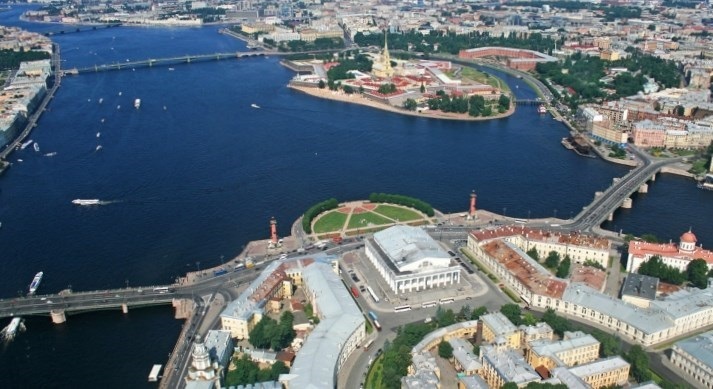 To create a harmonious ensemble, an artificial embankment with a semicircular area is constructed in front of the exchange building, which has pushed the Spit of the Basil Island to one hundred meters towards the Neva. A contrast effect of volume of the exchange and a powerful horizontal line of the granite embankment with descents to the Neva were created. The created semicircular ledge was used for the front marina of the seaport. Sloping descents to the water were decorated with giant granite balls, and the wall of the embankment - lion masks. According to legend,the author of the balls Samson Sukhanov cut them out by sight, without measuring instruments. From the building of the exchange, the southern and northern warehouses are divided, which served as closed warehouse premises. Now in the northern warehouse of the Exchange, on the bank of the Little Neva, is located the Central Museum of Soil Science named afterV.V. Dokuchaev. In the southern warehouse is locatedzoo museum. We can see the Exchange building on a 50 ruble Russian banknote. On both sides of the Exchange Square, two massive columns rise, serving as lighthouses at the entrance to the port. Their height is 32 meters. The columns are decorated with fore parts of ships - rostra and anchors. At the base are colossal figures, symbolizing the Russian rivers - the Volga, the Dnieper, the Volkhov and the Neva. According to legend, in ancient Rome there was a custom to erect columns in honor of sea victories and decorate them with rostra, which steal enemy ships. 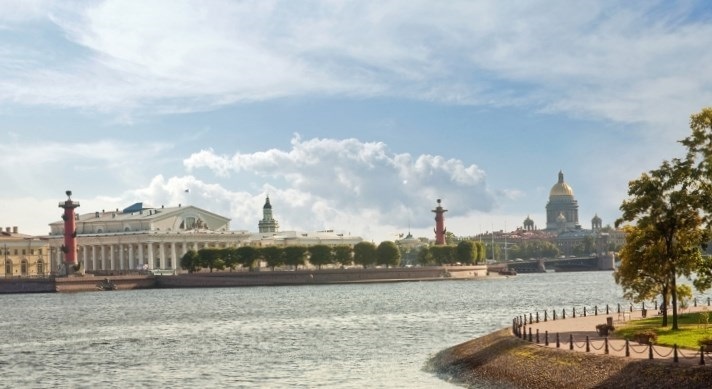 Rostral columns are the symbol of the power of Russia as a marine state. During theblockadeof Leningrad on the Spit of the Basil Island were artillery batteries. Central Museum of Soil Science named after V. Dokuchaev. It is located in the northern warehouse of the Exchange. Address: 199034, St. Petersburg, Exchange Square, 6, phone Literary Museum (Pushkin House, Literature Institute of Russian Literature of the Russian Academy of Sciences is located near). Address: 199034, St. Petersburg, Makarova embankment, 4.